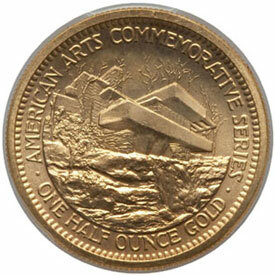 The American Arts Commemorative Series Gold Medallions were produced across five years, with two different designs issued per year. All medallions were struck at the West Point Bullion Depository (before it gained full mint status) and do not carry a mint mark. The mintages range from a low of 35,000 pieces for the 1985 issues featuring Helen Hayes and John Steinbeck to a high of 1,000,000 pieces for the 1980 issue featuring Marian Anderson. Perhaps more important than the mintage figures are the sales figures, which reflect the number of medals that were purchased from the United States Mint. These figures range from a low of 32,572 for the 1984 John Steinbeck Medallion to a high of 390,669 for the 1983 Robert Frost Medallion. It should be noted that during the years from 1982 to 1983, the medallions were exclusively distributed by J. Aron & Company, which was subject to certain minimum purchase requirements. For both years, the firm met these purchase requirements, but was only able to sell approximately 15% of the medallions to the public. Although it has never been confirmed, it is rumored that the unsold medallions were melted, greatly diminishing the surviving population. In terms of surviving populations, it is generally believed that the 1983 Alexander Calder Medal is the scarcest with perhaps 7,000 pieces surviving. The next scarcest issues are believed to be the 1984 issues featuring Helen Hayes and John Steinbeck.